There are versatile games that you can play the whole company at the age from small to large, and it will be interesting for everyone. 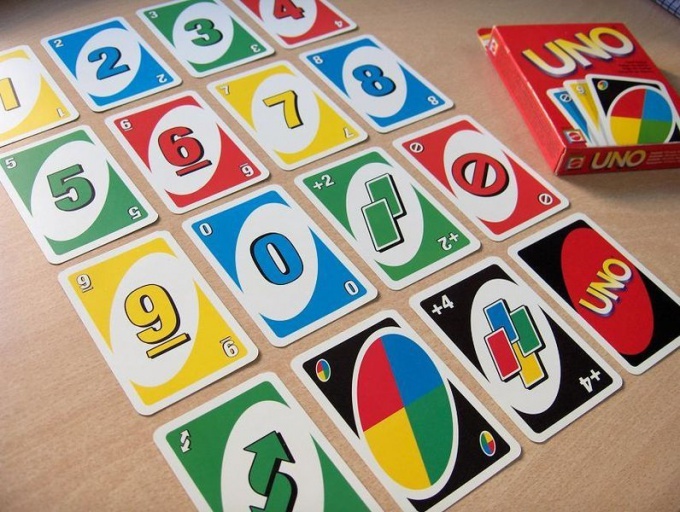 One such game is UNO. This game is from the category of family games came to our country from Europe and quickly found its fans. It is not very expensive, literally fits in your pocket. The rules are not complicated, just need to find a few minutes to study them. And the first few times you play with the tips. parties from 2 to 10. Each player must take one card to determine the dealer. Will take whoever has the highest card. The dealer shuffles the deck and puts everyone 7 cards. The remaining cards are stacked "community cards" face down and the top card of the Widow cards is dealt face up next to - this is a stack Reset. The game begins with the person left of the dealer. He should put in a stack the Reset map corresponding to the existing in color, in order of seniority or importance. Further, the turn passes to the next player. If the "Reset" put a value "on the Contrary", then the game changes direction, that is, the following will not be player on the left, and the one that sits to the right. So it will be until "Reset" will not put again the map "Backwards". You have to be very careful not to get confused and not to abuse the wrecking neighbor. Lucky you if you have a reserve match cards, in the event that the course will return back to you. If no suitable cards or the player doesn't want for some reason to spend it, then "Widow" takes another card. If it fits, it goes into "Reset", if not, the turn passes to the next, and take the card the player takes. In addition to the "Contrary" is in the deck some more active cards with different values, which can be pretty "annoy" rivals. "Take two" means that the next player must take from the "Talon" hands himself two cards at once. "Miss turn" - the turn passes to the next. "Order colour" - this card can dramatically change the course of the game. It is placed on the card of any value and at the same time is the color that will be handy put it to the player. And then during the game it will be assumed that in the "Reset" is exactly the color that was called, up until someone again does not change. The "coolest" map - it "book a colour and get four." It not only changes the color of the games, but also instructs the next player to take the extra four cards from the "Talon", a flowing, accordingly, your move. The aim of the game is to discard all of your cards. When one of the players has only one card remaining in his arms is the most crucial, climactic moment. The player must shout "UNO! ", which means "One". But if he forgets to do it and someone catches it in the gullibility and shout "UNO!" instead, that player is subject to a penalty of two cards from the "Talon". In this point of the game - need to be fully concentrated and to follow not only their cards and the game and number of cards opponents have to catch before they know to shout "UNO! ", and that no one violated the rules. For violations penalties rely. For example, you cannot tell - a penalty of two cards from the "Talon". If a player is caught in that put the wrong card, he must take her, take two more cards from the "Talon" and skip the turn. Not without a good reason to use the card "book a colour and get four, but only if you really on the hands is not appropriate. If a player is suspicious, he is obliged to show all their cards to the person whose turn it is next and who will be forced to take the extra four cards. At the same time, if the suspicions proved unfounded, suspicious neighbor is punished for two cards from the "Talon". But if his concern is "framed" is confirmed, then the culprit himself takes four additional cards and skips his turn. This is the classic rules of UNO. In the prospectus accompanying the game, you can find other versions of the game together, in pairs. And complicated ways like "UNO seven-zero," for example. If you decide to play this variant, every time falls to zero, all the participants will have to give their cards to neighbors in the direction of the game. And if you roll a seven, then the player who placed it in the "Reset" swaps cards with any player of choice. UNO game on attention and speed of reaction. Increase the pace of the game as the accumulation of experience possible. When the period of development of the rules passed, the real battle starts. And I must say, it is very addictive, and good for the brain noticeable. The winner is the person who was able to score 500 points (for all rounds). Points will be awarded if you managed to get rid of all cards before your opponent. The more people are going to play, more fun, more difficult and exciting.